This whole recipe takes about 25-30 minutes. Go ahead and cook the quinoa. Usually 12-15 minutes does the trick, but check your packaging, of course. Dice the shallots very finely then add a smidgen of olive oil to a pan, swirling it around. Place the shallots on low heat, stirring occasionally. While the quinoa and shallots are cooking, chop up your carrots, zucchini, cucumber, olives and tomatoes. Set them aside in a large bowl. Pour the pine nuts into the veggies, and then measure out your sun dried tomatoes and add those to the bowl, as well. Add your arugula. Juice our lemon into a separate small bowl, then add the ACV with olive oil and dried oregano. Whisk until frothy. Once cooked, allow the quinoa to cool for 5 minutes with the lid on. Take the lid off and cool for another 5 minutes. 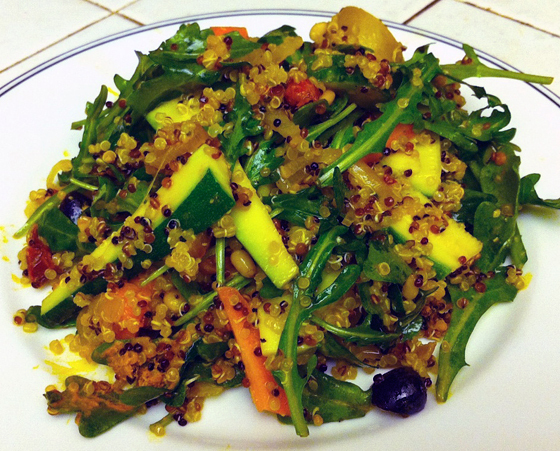 Add the quinoa to the bowl with the salad in it, and pour the dressing on. Take the sautéed shallots off the burner and then add the turmeric and the garlic powder. Mix with a large spoon and add salt and pepper to your liking. Give it a good taste before you serve it to adjust the spices as you like it! I love this meal because I can make it for dinner, and then easily have a lunch out of it for the next two days. I use it as a main dish, but it can certainly be a lovely side dish to a baked sweet potato, corn on the cob or a salmon steak, depending on how hungry you are. The protein and fiber in the quinoa really pack a punch! Other great additions to add (or subtract) to this dish are: bell peppers, green onions, goat or feta cheese, slivered almonds, sprouts, pea shoots, apples, dried cranberries, avocado, artichoke hearts, etc. Really, whatever you may have in your cupboard! If you were really feeling adventurous, or if it was all you had, you could make this with farro, barley, or couscous as the base. They all work! This meal is what I make when I am really stretching myself for another trip to the grocery store. That’s why it’s always good to have frozen veggies on hand! I buy them even when I don’t need them because I know, at some point in the near future, I will! What are your favorite “rainbow” combinations in food? Toss the yam in olive oil and sea salt before I roast it for about 20min at 350. For the dressing, throw all ingredients into a mason jar and shake up.